I feel like 2018 is going to be my year of dresses - there's so much going on and so many reasons to get dressed up. I don't just mean my wedding dress but also all the excitement surrounding it. My hen weekend abroad and then my honeymoon will both need dresses that I absolutely love and mark the special occasion. On top of our wedding we've also got other weddings to attend this year (I think we're just at that age) and the thing about social media is you don't want to get caught out outfit repeating - oh the Lizzie McGuire struggles. So I'm on a bit of a mission to make sure my wardrobe is up to date and ready to make me look and feel fabulous. Enter, centre stage Cari's Closet. Cari's Closet is clothing boutique based in Ireland, stocking the most gorgeous outfits for special occasions. With dresses perfect for bridesmaids and weddings guests I love everything about it. The selection of dresses are on trend, designer style, high quality pieces without breaking the bank. Having been around for 5 years it's become a favourite with celebrities and I jumped at the chance to get in on the action. 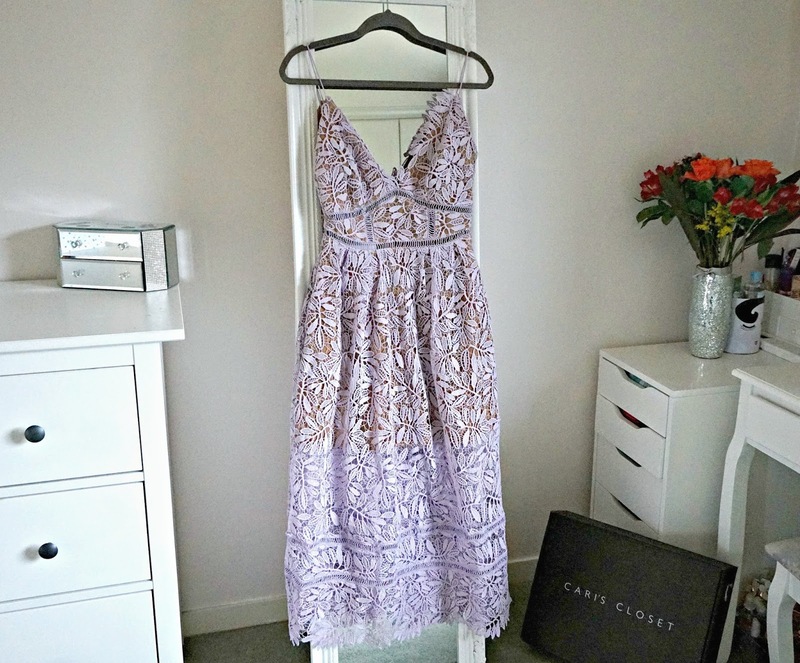 After admiring the huge range of dresses I picked out a gorgeous pastel dress in lilac lace, something I haven't worn before. The Alex Lace Midi Dress is a stunning dress that's just perfect to wear to a Spring or Summer wedding. Baring in mind I'm only 5 foot 3 inches tall so the Midi Dress became a little more of a Maxi dress, but with the raw lace hemline and shorter lining it still looked elegant without looking like I'm drowning under fabric. The dress really pulled me in at the waist and the ladder trim and detailing added a lovely silhouette and shape. The dress has a plunging back and concealed zip but was still perfect with a normal bra. I can't bare trying to enjoy a night out in a stick on bra that you're worried might fall off at any second. This special occasion dress also has pockets, who doesn't love a dress with pockets!? Delivery from Cari's Closet was brilliant, my order was processed on Thursday and my parcel arrived on Monday; that's not much different than delivery from within the UK. The packaging definitely added to the excitement of receiving my dress. The box and tissue paper made it feel much more special than the usual cellophane and parcel bags. It really did feel like a special occasion dress, the sort you would order for your birthday and treasure forever. 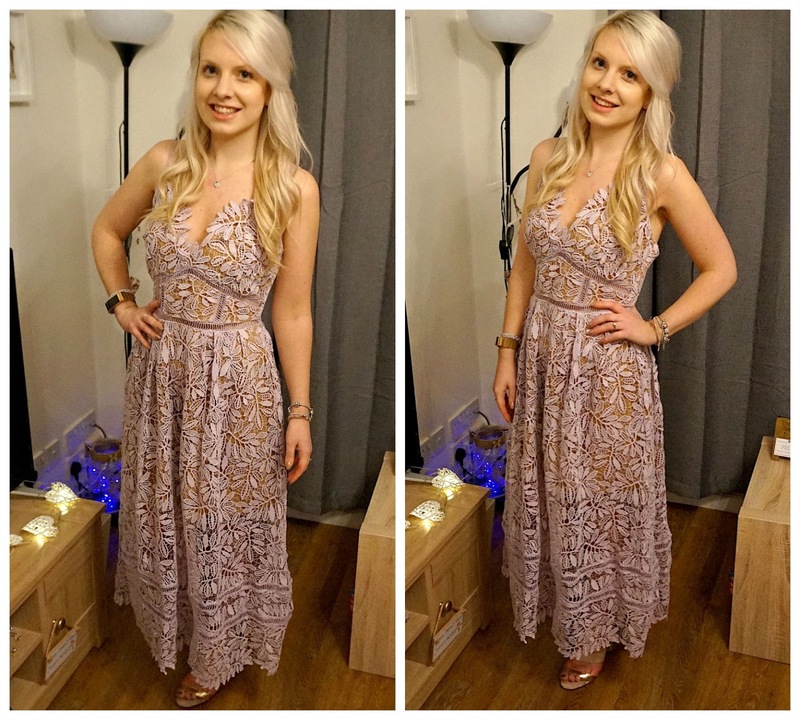 If you're on the lookout for a dress for something special this year then I'd highly recommend checking out Cari's Closet. Their new arrivals update regularly, they have dresses in colours to suit all skin tones and there's a style of dress to suit every body shape. They've just made it hard to narrow it down to one!